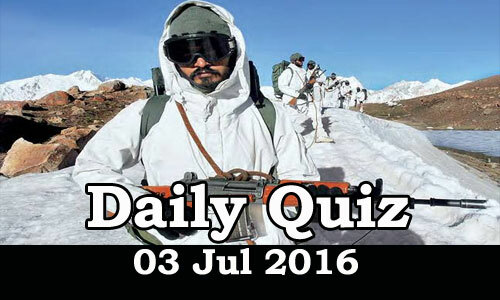 Daily Current Affairs Quiz 03rd Jun 2016, Current affairs and GK questions on National and International are listed in the Quiz. Candidates those who are preparing for Government Jobs and IBPS/SBI/RRB exams and all other exams can use these questions. 1. Which of the following Indian state has decided to introduce “File tracking” mechanism to bring in transparency in governance and to allow common people track the position of a file? 2. Which of the following Indian state has decided to introduce moral education as a subject for students of Classes VI to XII? 3. Who inaugurated a smart model village pilot project at Rashtrapati Bhavan, Delhi? 4. Mission Kakatiya for restoration of minor irrigation tanks with an objective of water conservation and improving groundwater table is implemented by which Indian state? 5. According to Switzerland central bank's latest update what is the India’s Rank in terms of citizens holding money with Swiss banks? 6. State Bank of India has inked agreements with the World Bank for a _____ million dollar facility to support grid-connected rooftop solar programme in the country. 8. Name the mobile app which will be launched by the Telecom Regulatory Authority of India through which consumers can check the speed of internet connection on their smart phones. 9. The Union Sports minister Dr Jitendra Singh announced a grant of _______ lakh for ailing Olympic gold medallist Mohammed Shahid. 10. Name the Former French Socialist Prime Minister who died on July 3 at the age of 85.